Can't attend? Follow Symmetry Entertainment to know of future events! The Wilderness is Explosions In The Sky's sixth album, and first non-soundtrack release since 2011’s Take Care, Take Care, Take Care. True to its title, The Wilderness explores the infinite unknown, utilizing several of the band’s own definitions of “space" (outer space, mental space, physical geography of space) as compositional tools. The band uses their gift for dynamics and texture in new and unique ways—rather than intuitively fill those empty spaces, they shine a light into them to illuminate all the colors of the dark. From the electronic textures of the opening track to the ambient dissolve of closer “Landing Cliffs,” The Wilderness is an aggressively modern and forward-thinking work—one that wouldn’t seem the slightest bit out of place on a shelf between original pressings of Meddle and Obscured By Clouds. The first EITS album not produced entirely by the band, The Wilderness finds them working with long time collaborator (and Grammy-winning producer) John Congleton in a co-producer role for the first time, and the band's most ambitious songs to date branch into unexpected new dimensions accordingly: “Logic Of A Dream” lives up to its name, its celestial symphonic swells overcome by relentless tribal drum patterns that dissolve into a gentle Krautrock outro. The cacophonous washes that open “Disintegration Anxiety” resolve into a locked groove marking a rock solid midpoint of the journey, followed by a deconstructed ambient soundscape “Losing The Light.” “Colors In Space” is particularly beautiful and brave, cycling through sublime atmospherics and motorik drive before building to a whiplash-inducing halt. Arguably the most progressive instrumental rock album since The Earth Is Not A Cold Dead Place, The Wilderness is a bold, experimental work combining the EITS song craft that has sold hundreds of thousands of albums and tickets with the cinematic sensibility that has elevated the band to the level of regard and demand they enjoy as film composers. It is an album where shoegaze, electronic experimentation, punk damaged dub, noise, and ambient folk somehow coexist without a hint of contrivance—and cohere into some of the most memorable and listenable moments of the band’s expansive body of work—“proper” studio albums and major motion picture soundtracks alike. The progressive ambience of early Peter Gabriel, the triumphant romanticism of The Cure in their prime, and the more melancholy moments of Fleetwood Mac all inform the curious beauty of The Wilderness. The uncanny ability to reconcile the tension between discordant, nightmarish cacophony and laid-back, Laurel Canyon-inspired folk-rock is a cornerstone of this album, and the center of Explosions In The Sky's remarkable evolution. If The Earth Is Not A Cold Dead Place was the defining album of Explosions In The Sky's career, The Wilderness is the band's [re]defining album. 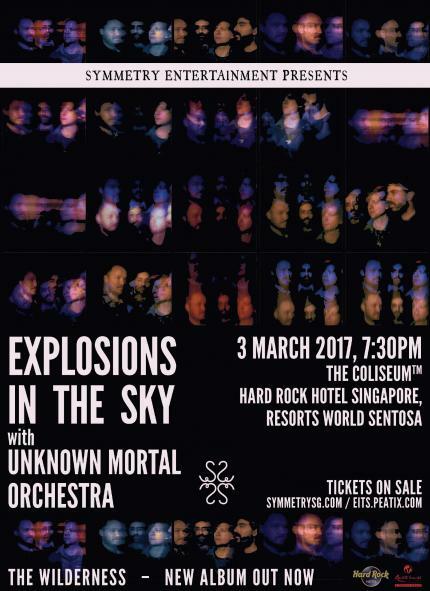 Explosions In The Sky is: Chris Hrasky (drums), Michael James (guitar, bass), Munaf Rayani (guitar), Mark T. Smith (guitar).